One Woman’s Motorcycle Adventure Through Africa…. To most thirty-something women, walking across the street to get a skinny latte and the lastest copy of heat in excruciating high heels is an all-terrain task in itself. But Lois Pryce isn’t just any woman – nine to five and post-work white wine spritzers have never been her thing. Unafraid of a challenge – having already ridden her motorbike from Alaska to the southernmost tip of South America – she decided she could never be one to settle for a last minute package holiday in Viva Espana. So, she began the kind of adventure most of us could only dream of. Donning her sparkly crash helmet and armed with her trusty maps and a baffling array of visas, Lois got on her bike once more to make an impressive journey. Alone. No support vehicles, no fancy GPS and no satellite phone. Leaving from London, finishing in Cape Town – and the small matter of tackling the Sahara, war-torn Angola and the Congo Basin along the way – this feisty independent woman’s grand trek through the Dark Continent of Africa is the definitive motorcycling adventure. It was certainly never going to be easy but, equipped with a formidable strength of character and an immense passion for life, Lois Pryce’s astonishing achievement is an inspiration to us all. She paints a vivid picture of travelling through the vast African landscape. 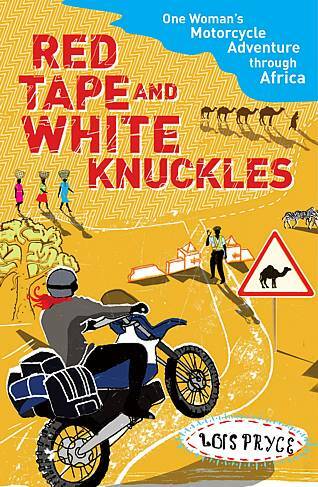 Colourful and hilarious, Red Tape and White Knuckles is an action-packed tale about following your dreams that will have you packing your bags and jetting off into the sunset on your own adventure before you know it.